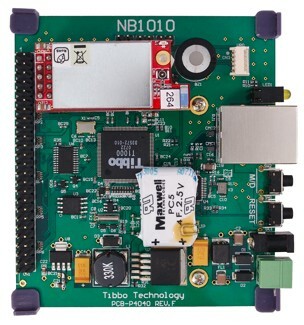 The NB1010 board is functionally equivalent to the EM1000 embedded module. 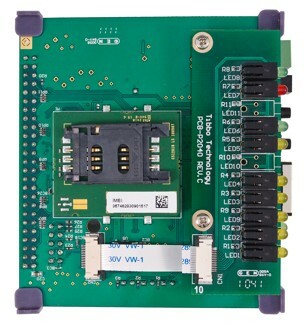 The board features Ethernet, as well as optional Wi-Fi and GPRS network interfaces. If you only need the Ethernet interface, then you may use the NB1000 board. The NB1010 product includes the LB1000 LED board as well. The NB1010 and the LB1000 come assembled together and interconnected by the LC1000 cable. Additionally, the NB1010 comes with the IC1000 interboard cable. Therefore, you don't need to order the LB1000, LC1000, or IC1000 separately when purchasing the NB1010 board. Read carefully the explanation about external antennas that should be used when the NB1010 is ordered with Wi-Fi and/or GPRS options.